El Nido may not have a culinary scene that is as booming and cosmopolitan as some of the Philippines’ bigger cities like Manila or Cebu, but despite its size, it still offers an impressive amount of variety for visitors. There are a few carnederia (the equivalent of a Filipino diner offering chafing dish specials with copious amounts of rice) scattered along some of the quieter streets that meander away from the main tourist drag, but by virtue of the fact that the town very much caters to foreign guests, you’re more likely to happen into a restaurant catering to international tastes rather than the local ones. And as with lodging, you’ll find establishments that cater to all budgets, from the supremely cheap (and hygienically suspect) carnederia to hoity-toity French restaurants on the beachfront. When it comes to deciding on where to eat in El Nido, the options can be overwhelming and it may be hard to determine which places are most deserving of your patronage. While I won’t pretend that this guide is at all exhaustive (as you might expect, there are a lot of bars in El Nido, but being who we are, we went to not a single one of them! 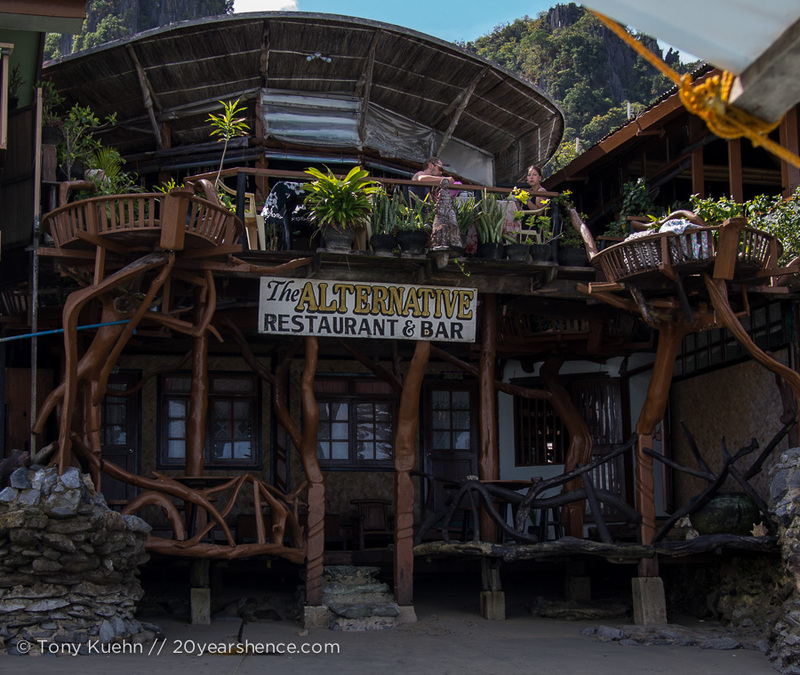 ), if you ever find yourself in El Nido, we do have some suggestions for places you might wish to seek out. 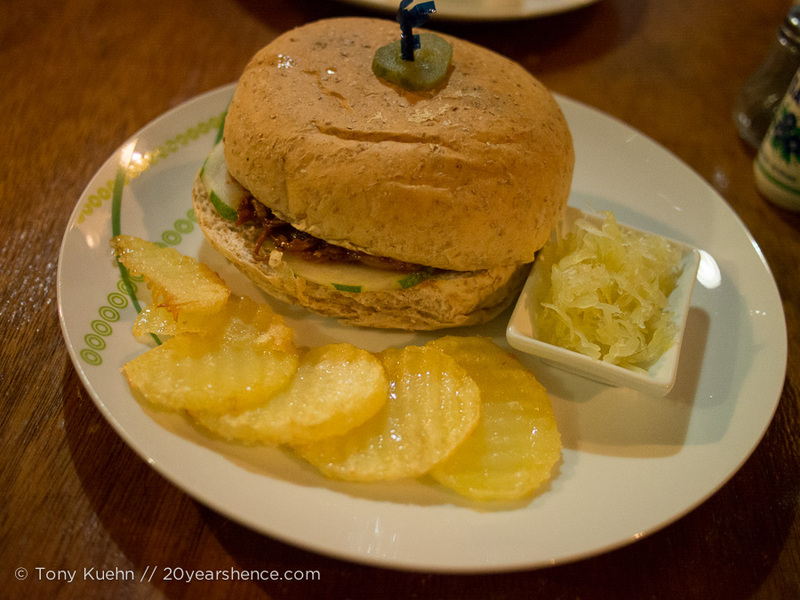 So here is our list of where to eat in El Nido, and what dishes are worth seeking out. 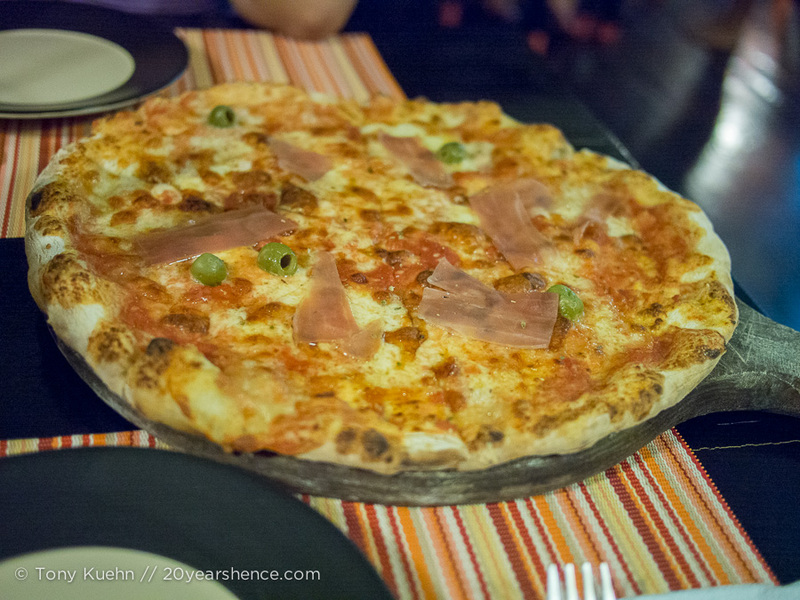 I know, I know—you can get pizza in pretty much any city anywhere on the planet and El Nido is no exception. As you’d expect, you can find some pretty poor imitations of the stuff that make the $5 frozen pies you could pick up back home look down-right appetizing. For instance, if you make your choice based on a guidebook you might wind up at El Nido Arts Boutique; we split a vegetarian pizza there which had great fresh toppings, but although the price (and our waitress) suggested it was big enough for two, it really wasn’t enough to share making this not great value in our mind. Instead, head to Altrove where you’ll pay about $10US for a pizza but you get something that is greater in all respects. Though it definitely constitutes a splurge, it’s well worth it and one pizza should be enough for two reasonably hungry adults. This pizza is honestly about as authentic as you’re likely to find outside of Italy; the restaurant boasts a wood-burning oven, and it shows: the crust is absolutely perfect (crisp but still slightly chewy, though definitely not doughy!) and the sauce was light, tangy and obviously made with fresh tomatoes. 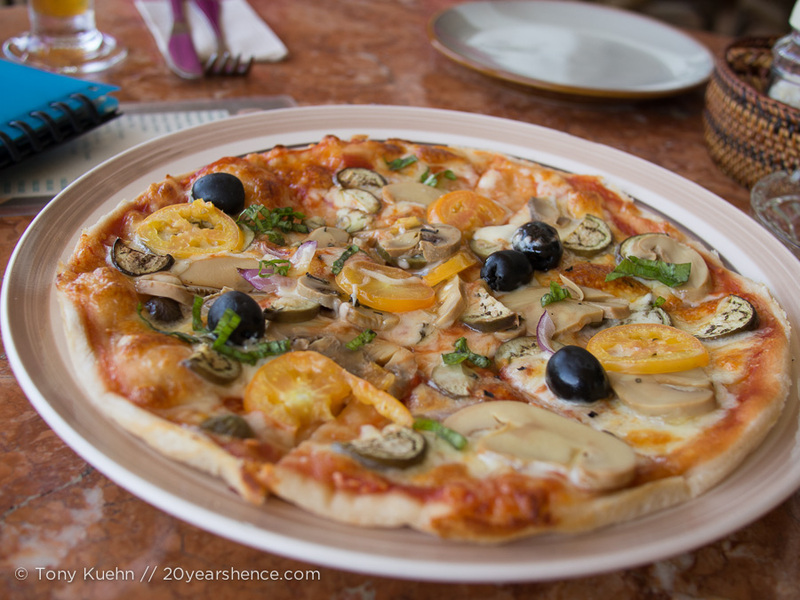 This wasn’t just some of the best pizza we’ve had on our trip to date, but some of the best we’ve had anywhere. Period. 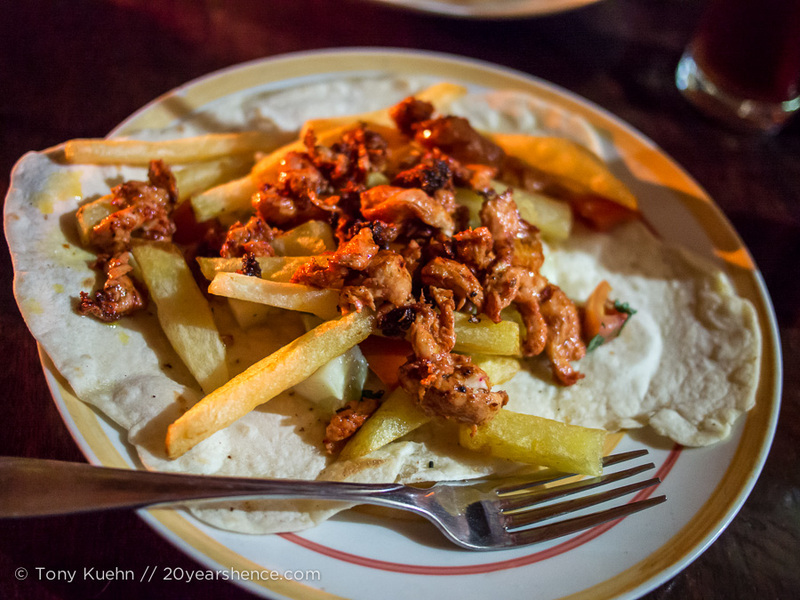 If you’ve read our Chewing the Fat interview, then you know that the one cuisine we tend to miss & crave the most while on the road is Mexican food. You just don’t see that many places even attempting to offer it unless you head somewhere tourists are known to flock, and even then, the stuff you’re likely to be served is dicey Tex Mex at best. 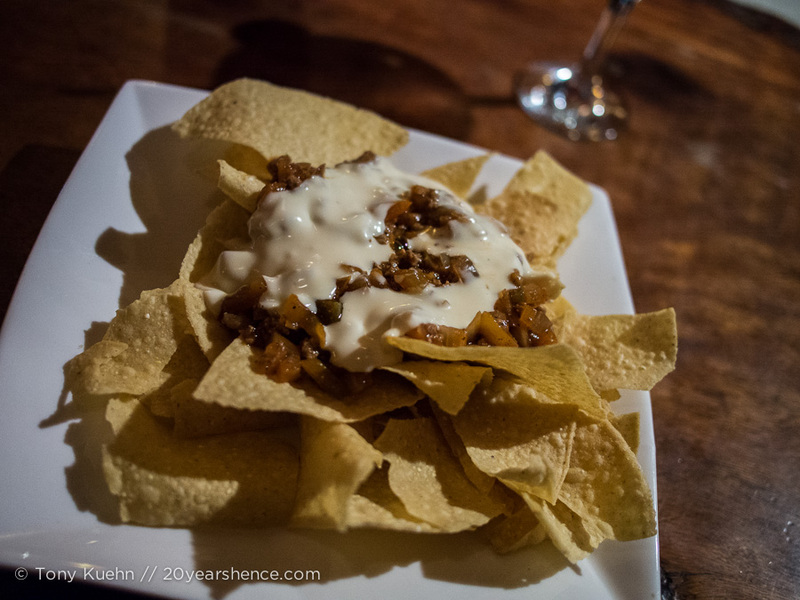 Lonesome Carabao Lounge is certainly not going to change your mind about that, but if you just have to have your Mexican fix, you could do worse. The burritos are acceptable if not outstanding and the nachos are actually fairly decent, especially if you partake in the Happy Hour 2 for 1 drink specials on offer. Sure they’re pretty much just slathered in chili & cheese, but when you’re chasing them with frozen mango margaritas, you won’t be complaining. 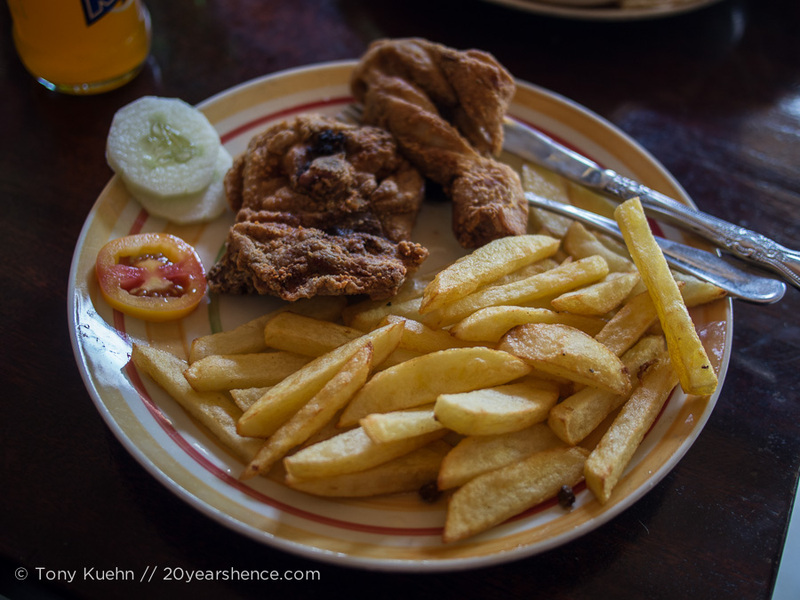 Although finding authentic Filipino dishes may not be quite as straightforward as one might wish, glimmers of the country’s penchant for creative culinary combinations (this is the country that puts shredded cheese on desserts, after all) can still be glimpsed at several of the otherwise “Western” restaurants. Sanctuary has a really nice ambience in the evening, and offers up food that is generally solid, though there were some interesting surprises to be had as well: one night we each ordered sandwiches—Tony ordered the BBQ pulled pork, while I went with the slightly more daring ebi (shrimp) with cucumber & mango (see! There’s that Filipino ingenuity for you! )—that were advertised as having a side of sweet potato fries. 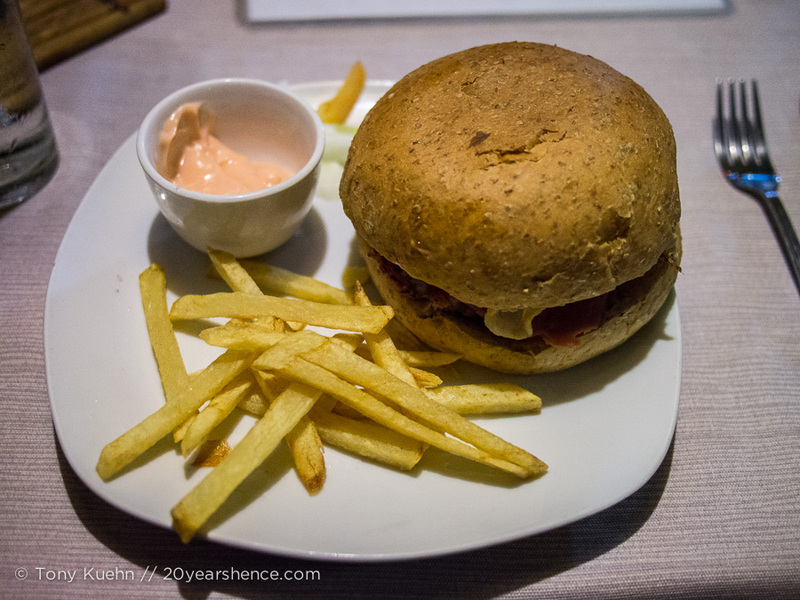 Neither of us had any complaint with our sandwiches (though unconventional, the flavors in my sandwich actually worked very nicely together), but the fries turned out to be slices of regular potatoes that had been pan-fried and then sprinkled with sugar! We can’t argue that the listing was misleading, but they were definitely not what we had in mind and were a less successful pairing. If ever you needed an example of just how much Filipinos love sweet things, I think you have it right there. It’s probably not surprising that a country that loves sugar as much the Philippines clearly does might not demonstrate the healthiest of eating habits as a general rule, and while we found it very easy to get more than our fill of meats and starches (no meal is considered complete unless rice is involved), it was definitely more challenging to get vegetables. No lie, this is a place where “spaghetti with tomato meat sauce” is listed under the vegetarian section of the menu (when such a section even exists), because the dish involves tomatoes so that makes it vegetarian. 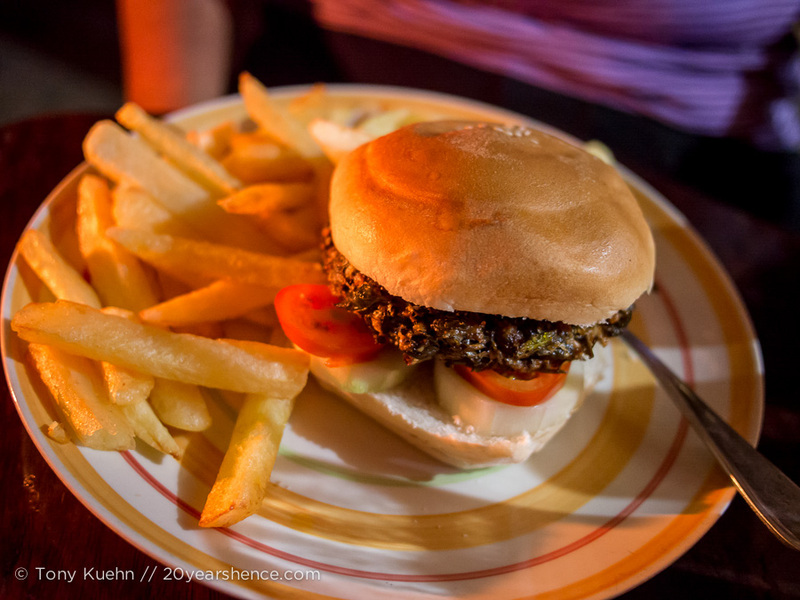 With this in mind, I was pretty much over the moon when I heard about Blueazul, rumored to serve up a decent falafel burger. Of course, this being the Philippines, there had to be some kind of twist, and this case, the falafel in question actually involved no chick peas whatsoever, but instead was largely made up of some kind of slightly bitter leafy green. Falafel purists would probably throw a hissy fit over whether this can in fact be considered falafel, but I’m not one of them. The chef and owner reportedly used to cook over in the UAE, so I’d wager he knows a thing or two about falafel. More importantly, the burger was crispy, had great texture, and was just as filling and satisfying as a more traditional falafel, which is good enough for me. I liked it so much, that on a repeat visit I ordered the falafel plate that came with pita and a spicy dipping sauce. If you just have to get your fill of meat, this place also does good poultry dishes. Tony ordered a fried chicken dinner one night, and the chicken came out perfectly fried, which is to say it was crunchy (but not greasy) on the outside, but nice and moist on the inside. His chicken tikka wrap was also good, though confusingly came with the fries mixed up inside it rather than on the side. They were good though! Last, but certainly not least, you’ll want to have at least one meal at The Alternative. Tony honed in on this place using the tried & true method of walking by and noting that whatever they were cooking smelled really good… and it was. Like we always say, your nose knows! While there are a fair number of fancy restaurants, for our money, this is the place to spend a little bit more (though you’ll rarely pay more than $5 or $6 per plate, which does constitute a splurge in the Philippines). 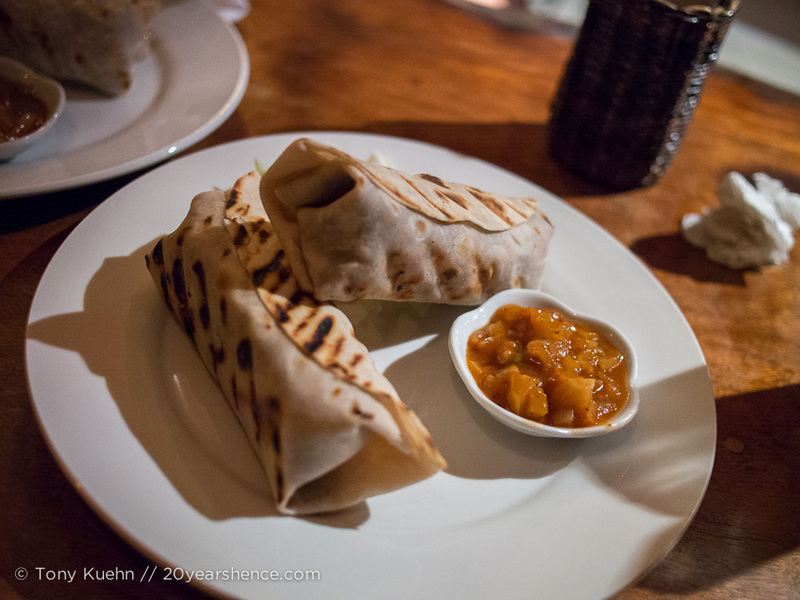 You can try many Filipino and pan-Asian dishes with an upscale twist, and it has an actual vegetarian menu that spans an ENTIRE page! I had a coconut-based eggplant curry whereas Tony went carnivore once more and had a chicken curry. Both were hearty, rich, and crammed with flavor. Also, even though the food here is good enough to warrant a visit, we also have to tip our hats to the amazing design. Many Filipino restaurants and hotels are somewhat lacking in ambience or charm, but this place completely charmed us as it was so full of character. Rather than being a soulless concrete box, it was light and airy, and we loved getting to have our dinner out in a “nest” that extends out over the beach. It was an awesome place to watch the sun set, and we got to enjoy the most amazing views and refreshing sea breeze while we dined. Unsurprisingly, The Alternative is a boutique hotel in addition to a restaurant, but alas, although we found the food within our budget, the lodging costs were just a bit outside of our budget, so we got our fill by dining and drinking here instead. The heading pretty much says it all: you’re in El Nido for some fun in the sun, so you’d be remiss not to dine in at least one of the many bars and restaurants that line the beach. Given the location, the prices won’t be too bad, although most of them will cash in on that draw by being generally mediocre (with The Alternative being one of the few exceptions). We ate at one place that was suitably forgettable that I no longer remember its name, as the fact that we got to dig into our food with our feet buried in the sand and the waves lapping at our toes was far more memorable. Tony got a chicken sandwich, which he enjoyed until he took a bite and realized there was a big piece of bone that hadn’t been removed. 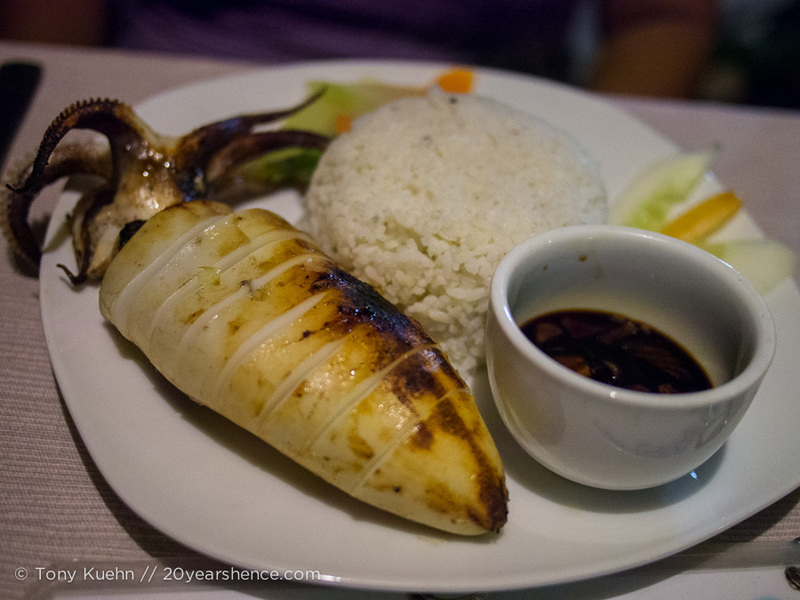 I went with a stuffed squid dish, which was a lot more successful and incredibly cheap at only $3 or $4 US. When you’re this close to the ocean, it probably goes without saying that opting for the seafood is probably your wisest course of action! In the end, it honestly doesn’t matter which place you choose, whether the food is good, or if the service is speedy; dining beachside offers you views too good to let anything detract from them! 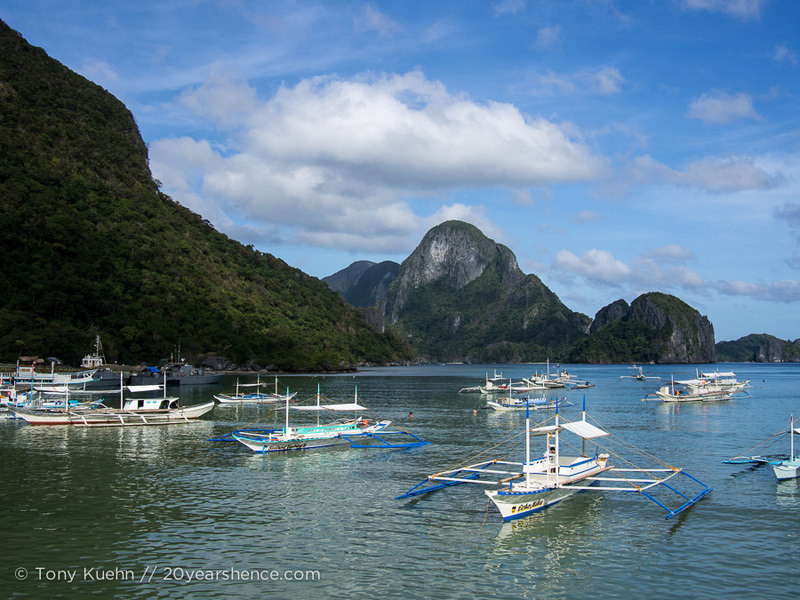 Palawan: The Philippines’ Final Frontier? I know there’s actually a deli in Pittsburgh that is famous because it puts the fries inside your sandwich, and I believe this is a thing that they do in the UK as well (actually, I think they have sandwiches where the only filling is french fries… but that’s a whole ‘nother issue), so it’s certainly not unique in that regard. In general, we found that Filipinos are pretty open to embracing new cuisines and unusual food combinations, so I wouldn’t be surprised if a little Greek slipped in there somehow! What are you guys doing? I just had breakfast and I’m already hungry again! I miss Mexican food, I would settle for tex mex or even just a nice taco pretending to be tex mex. I had to laugh at the sweet potato fries, it is as it says, just not as expected. Now, I’m going to locate a Mexican restaurant in Kuala Lumpur! Good luck with your quest! We thought KL actually had a lot of good food (though it was definitely not our favorite food city in Malaysia), but I don’t think we ever spotted Mexican. Lots of Indian though… which is one of the food types we really did not ever see in the Philippines! It’s so strange how similar the Filipino & Malay backgrounds are and yet how completely different their food scenes are! I can’t remember if Tony wrapped the whole thing up and just ate it, or if he picked at the individual parts… either way, I know he thought it was all pretty tasty! Love the little carrot flower garnish on the cucumber on the curry plates. I totally get it about the pizza and falafel. Been eating an alarming amount of both in Thailand just because I’ve found places that do them so well. “The nose knows”… love it. Will be following that advice the next time I’m on the prowl for my next meal, like, um, right now. We have ALWAYS found that when it comes down to following a guidebook/online travel site suggestion (personal blogs not withstanding) or relying on our nose and what smells good, our nose inevitably always leads us to better dining options. Places in Lonely Planet guides are always crammed with tourists, and we definitely prefer to follow the locals and eat wherever they go. The one exception was the Philippines, ironically, but generally speaking, your nose really does know! There’s a cart here that serves fries in their sandwiches, so maybe that’s why it doesn’t feel so weird to me…although it would be a little unexpected. Great wrap-up of the food and now I’m definitely going to hunt down that pizza! Yeah, it’s not like I’ve never seen fries inside other food items before, it’s just not that common and was just weird enough that it made us smile. Definitely splurge at least once at Altrove—you won’t regret it! I have never tried Philippino food before, but shrimps, mango and cucumber sounds like a winning combination to me! 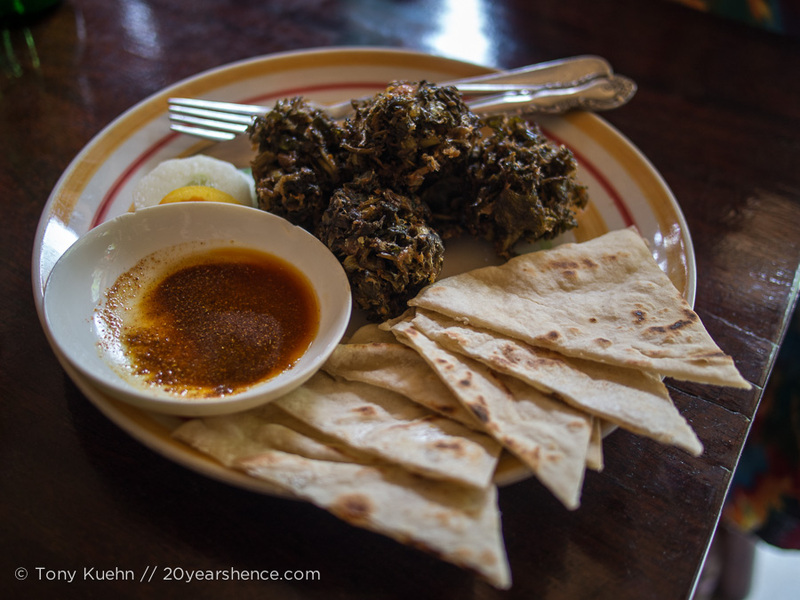 So now that you have travelled through the country a bit what’s the one Philippino dish that you would recommend? Surprisingly, we found it quite difficult to try a lot of “authentic” Filipino food that wasn’t already some kind of twist on American standards, which was a shame! 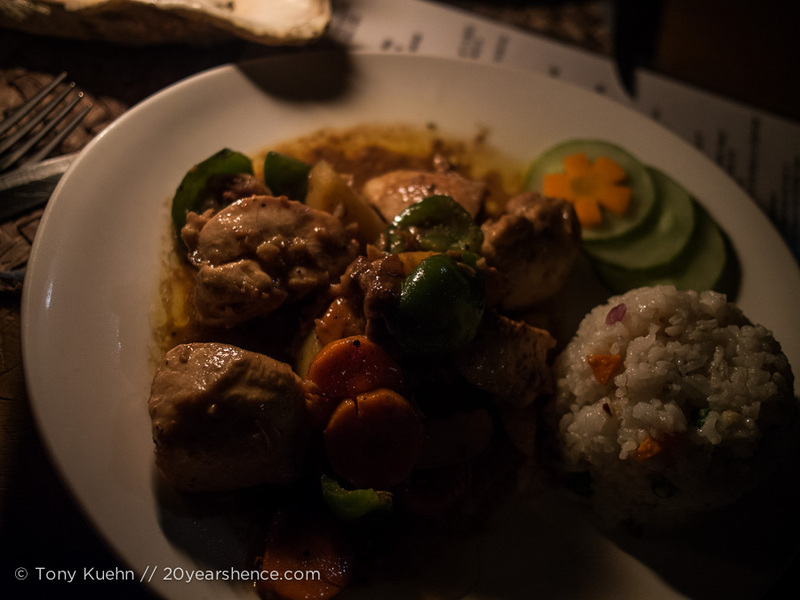 That said, everyone will tell you to try chicken adobo, and it is legitimately tasty even if there is no set recipe for it… I guess that’s part of the adventure, however, since every place you order it will be slightly different! Well-written and super-helpful! 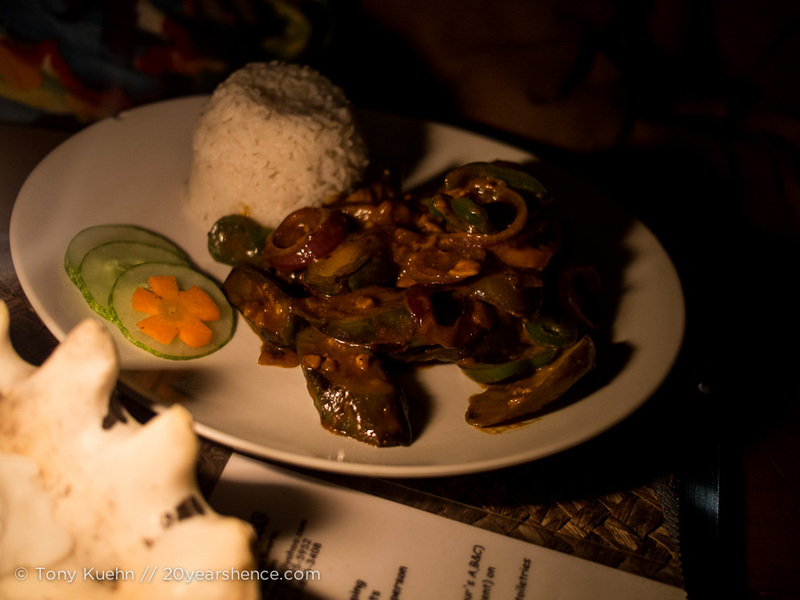 I’m going to El Nido in a couple of days and I had no idea what to expect from the food there!